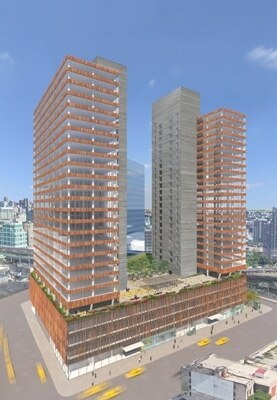 Tishman Speyer CEO Rob Speyer announced today the company is moving ahead with construction of a 1.1 million square foot office and retail project in Long Island City. More than 800,000 square feet of the available office space in the development has been pre-leased, including 250,000 square feet to WeWork, the world's largest provider of shared office space. Tishman Speyer is being joined in this development by Qatari Diar, a prominent global investor in world class real estate. This project concludes Tishman Speyer's purchase of 1.8 million square feet of development rights from the City of New York, which included a 700,000 square foot office building that Tishman Speyer completed in 2011 and pre-leased in its entirety to the New York City Department of Health & Mental Hygiene. Today's announcement completes the City's vision for the transformation of this site into a new center of the innovation economy. "Thanks to the City of New York's investment in the area's infrastructure, enlightened policy decisions and the active support of the New York City Economic Development Corporation, the local community and its elected officials, Long Island City has become a model for 21st Century urban development," Rob Speyer said. "Tishman Speyer is proud to continue our role in unlocking the area's full potential as one of the most dynamic, live-work-play neighborhoods, not just in Queens but in all of New York City." Deputy Mayor for Housing and Economic Development Alicia Glen said, "This project will be a major job generator for Long Island City. We are focused on growing good jobs across the outer boroughs and meeting the demand for new office space. What rises at this site will not only spur our economy, but make Queens Plaza a more dynamic place to live and work." Qatari Diar's Chief Development Officer, Europe & Americas, Sheikh Jassim Bin Hamad Al Thani added, "We are delighted to be working alongside our partner, Tishman Speyer on the acquisition of this site in Long Island City and this agreement marks a significant milestone. With exclusive retail elements and contemporary office space this new venture will set the standard for mixed-use developments." WeWork co-Founder Adam Neumann said, "WeWork is proud to be an anchor tenant of Tishman Speyer's Long Island City development. This will be a fantastic space for us to bring our community of creators to this thriving and dynamic neighborhood." The 250,000 square foot location will be WeWork's second and largest in the borough of Queens. "Long Island City continues to emerge as a vibrant hub of jobs and economic activity," said NYCEDC President Maria Torres-Springer. "These new towers will bring 2,000 permanent jobs to Western Queens, and represent a major step forward in solidifying Long Island City as a premier business district."